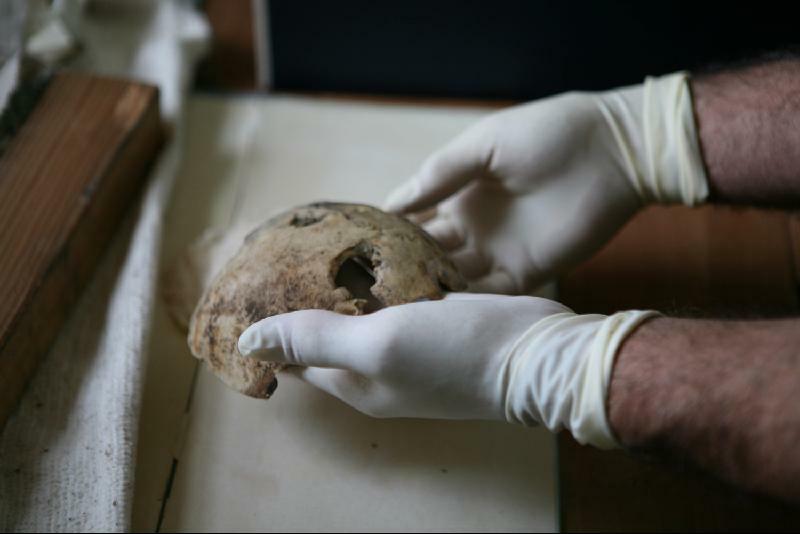 In a exhibition held in Moscow, Russian officials have exposed a piece of a skull that is supposed to be of Adolf Hitler, who allegedly committed suicide on April 30, 1945. 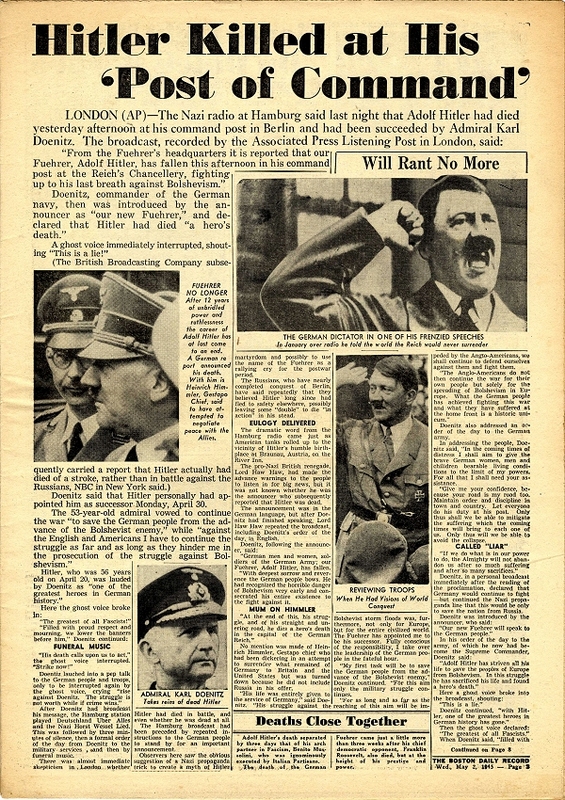 Over the years the disclosure of some facts, the publication of some works of credible and reputable researchers access to the alleged forensic evidence saved by the Russians meant that if you opened the door on the theory that Adolf Hitler did not in fact died in Berlin in 1945 . In fact as you will see later in the official version of events leaves many doubts as to its veracity. Hitler's skull belongs to woman? 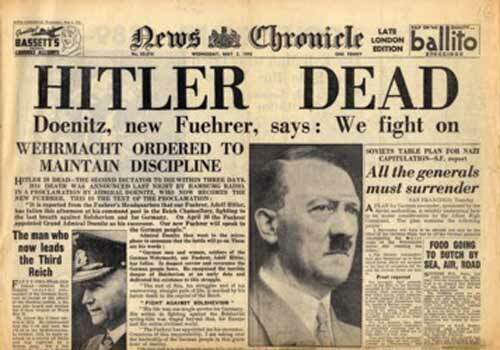 I invite you to reed the official version of the death of Adolf Hitler below. On April 29, was the day of the final meeting. General Weidling, military governor of Berlin, and commander of the LVI Panzer Corps, also raised the possibility of an attempt to escape through the Soviet lines, but dissuaded Hitler. 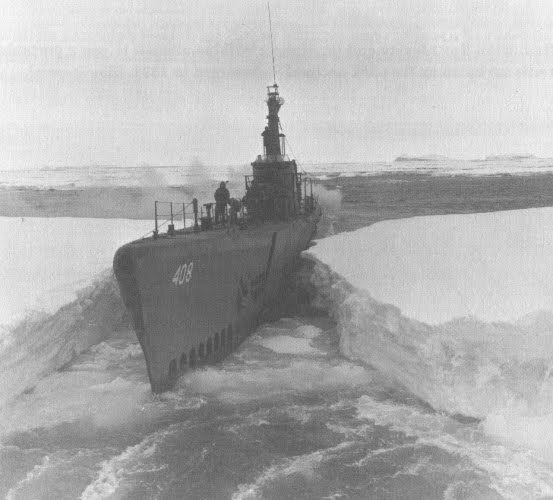 Had neither troops nor equipment or ammunition to any type of operation. The option was to stay and die! The Führer then formally saluted of the closest people that have followed im so far. those who were in the bunker reacted in an unexpected way. Many, after putting records on the phonograph, began to dance and happily got along with others, as if a crushing weight, suddenly, had been lifted off them. 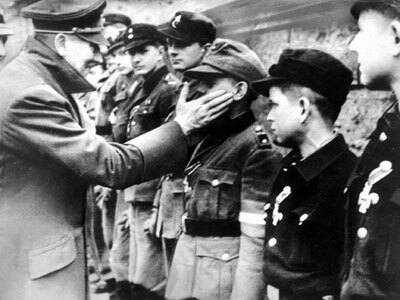 The allure of sorcerer that Hitler exercised over them ceased as if by magic. After lunch, on April 30, locked up with Eva Braun in his chambers. There was only one shot. When the close colaboraters entered they found him with his head shattered by a bullet and the gun lying on the lap. Opposite him, in the languor of dead, Eva Braun, with no visible injuries. She ingested cyanide, a very powerful poison. It was 15:30 hours! Quickly the two bodies, were wrapped in a tarp, removed to the courtyard and, with the help of 180 gallons of gasoline, fired, a vigorous pyre. Around them, a silent fascist salute paid them the ultimate tribute. On May 2, the last German defenders of Berlin capitulated before the Soviets. 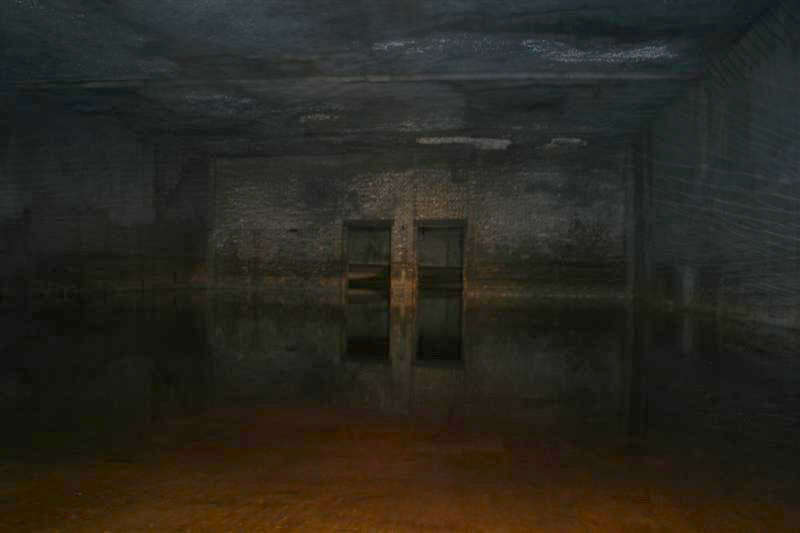 The Red Army entered the bunker where Hitler's were in retreat since January 17. They found the charred bodies of Joseph Goebbels, his wife Magda and their six children who had been poisoned. In the same place, the corpse of a man with a mustache, made the soldiers believe for a moment that was Hitler. In a detailed observation, concluded it was a lookalike .. Arose the suspicion that Hitler had fled, eliminating its double. 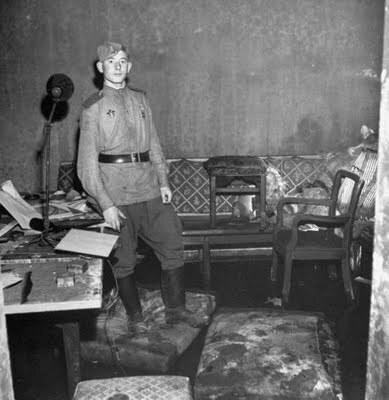 This body was discovered by the Russian contingent in Berlin and assumed to be Adolf Hitler. It is actually Gustav Weler, Hitler’s doppelganger (body double), who was executed with a gunshot to the forehead. Doubts about the death of Hitler would last for decades. 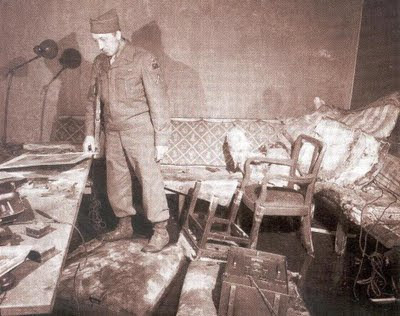 Two charred bodies were buried and found in a crater three feet from the door of the bunker. Secret autopsies are done to the bodies that were supposed to be those of Adolf Hitler and Eva Braun, who would have committed suicide moments after getting married. 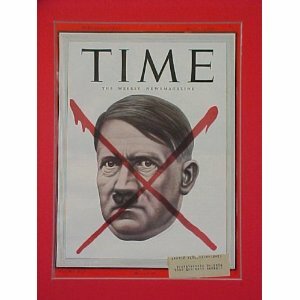 The obscure operations of the Soviets and the omission of facts, had created doubts about the death of Hitler. 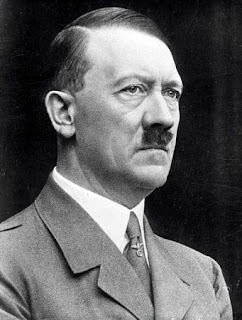 For over a decade the FBI (Federal Bureau of Investigation), service of American intelligence, undertook a hunt around the world, chasing false information that said that Hitler was living with a new face in the United States, Japan, Brazil, Colombia, and further investigated the hypothesis, Argentina. Unaware of autopsies, Stalin himself believed that the Nazi leader was alive. The final conclusions would only end with the Soviet Union in 1991, when secret documents were presented to the world. In 2000, the top of a skull, attributed to Hitler, was the attraction of an exhibition held in Moscow to commemorate the 55 years since the end of World War II. Some historians have doubted the authenticity of the skull, which they said could only be confirmed through DNA analysis. Legends, lies, obscure facts, the death of Hitler was a disappointment for the Allies, who had no visible body of the dictator for public viewing. 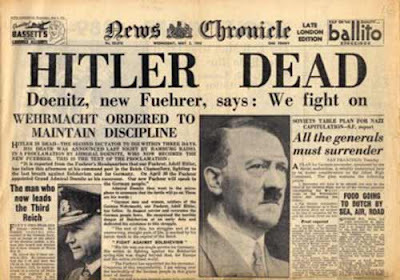 Hitler's death left many suspicions and misunderstandings. Hitler, the man who for decades had become the most feared and powerful of the world could still be alive. 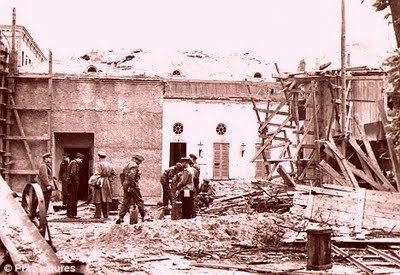 "Hitler's Escape There always have been doubts as to Hitler's alleged suicide in his bunker in Berlin on April 30, 1945. The most authoritarian doubter was the Russian Dictator Joseph Stalin who was convinced that Hitler escaped to Spain in April of 1945. 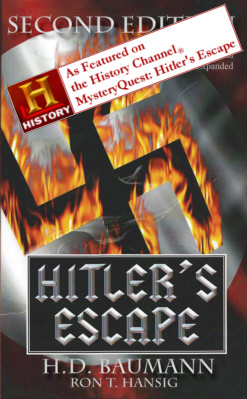 We now have a serious and well researched book by Ron T. Hansig entitled "Hitler's Escape" in which he makes a very convincing case that Stalin was correct in his statements to his western Allies in 1945, telling them that Hitler (and Eva Braun) were still alive. One of Hansig's starling revelations is, that the man present in the last days of April inside the bunker was, in reality a double of Hitler. 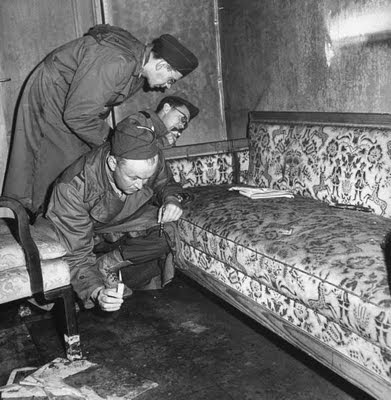 There even is a photograph of the corpse of the double taken by Russian investigators. 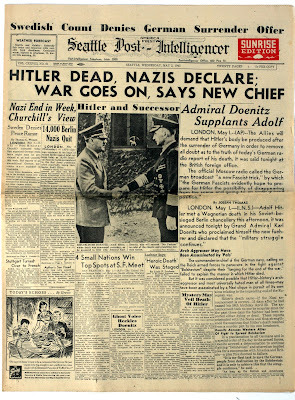 Hitler's death, at the end of World War II, assumed to be by his own hand, remains unproven. This assumption was the result of, what many conceive as, a conspiracy by the Western Powers, bowing to political pressures and to fight nazism, to come up with Hitler's suicide story. This then would explain Hitler's disappearance from Nazi Germany after Germany's defeat. Based on the well-documented revelations, this book can rightfully be called "the biggest detective story of the twentieth century". 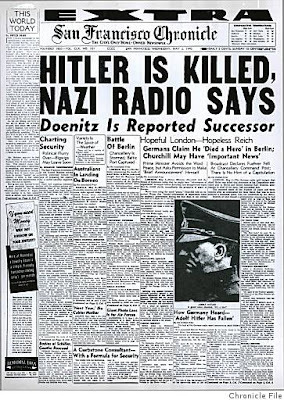 In 1952, Dwight D. Eisenhower said: "We have been unable to unearth one bit of tangible evidence of Hitler's death. Many people believe that Hitler escaped from Berlin." When President Truman asked Joseph Stalin at the Potsdam conference in 1945 whether or not Hitler was dead, Stalin replied bluntly, 'No.' Stalin's top army officer, Marshall Gregory Zhukov, whose troops were the ones to occupy Berlin, flatly stated after a long thorough investigation in 1945: "We have found no corpse that could be Hitler's." 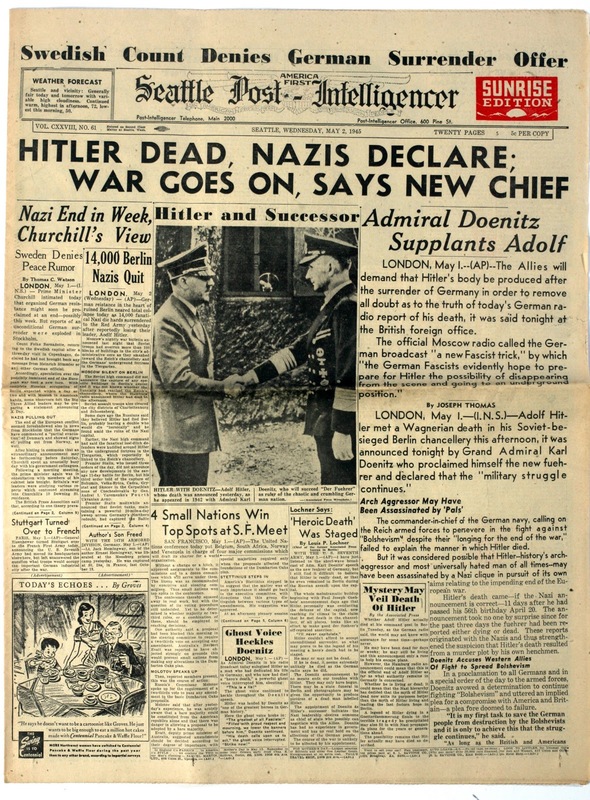 The chief of the U.S. trial counsel at Nuremberg, Thomas J. Dodd, said: "No one can say he is dead." Major General Floyd Parks, who was commanding general of the U.S. sector in Berlin, stated for publication that he had been present when Marshall Zhukov described his entrance to Berlin, and Zhukov stated he believed Hitler might have escaped. Lt. Gen. Bedell Smith, Chief of Staff to Gen. Eisenhower in the European invasion and later Director of the CIA, stated publicly on Oct. 12, 1945, "No human being can say conclusively that Hitler is dead." Col. W.J. Heimlich, former Chief, United States Intelligence, at Berlin, stated for publication that he was in charge of determining what had happened to Hitler and after a thorough investigation his report was: "There was no evidence beyond that of HEARSAY to support the THEORY of Hitler's suicide." He also stated, "On the basis of present evidence, no insurance company in America would pay a claim on Adolph Hitler." Nuremberg judge Michael Mussmanno said in his book "Ten Days to Die," "Russia must accept much of the blame [to the extent that it still exists] that Hitler did not die in May 1945." However, Mussmanno STATED that he interviewed Hitler's personal waiter, his valet, his chauffeur, his two secretaries, pilots, top generals, etc., and they all 'agreed' perfectly that Hitler committed suicide. He said they could not have gotten together afterward and made up a story that agreed in perfect detail without one flaw anywhere, so they must be telling the truth and he was absolutely convinced that Hitler committed suicide. 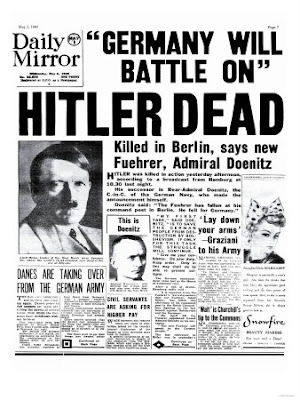 We are almost certain that the story we want to sell over the death of Adolf Hitler is a hoax, if so, if his death didnt happened that day to where was he supposed to escape and how? -The Gestapo chief Heinrich Mueller told his US CIC interrogators in 1948, that he arranged Hitler's escape from Berlin and that Hitler together with Eva Braun flew to Barcelona, Spain on April 26th, 1945. -Soviet Marshall J. Stalin in 1945 told many Allied Leaders that Hitler escaped from Berlin. -There never was an identifiable corpse of Adolf Hitler nor of Eva Braun. -The whole suicide story of Hitler rests solely on the testimony of four loyal Nazis. 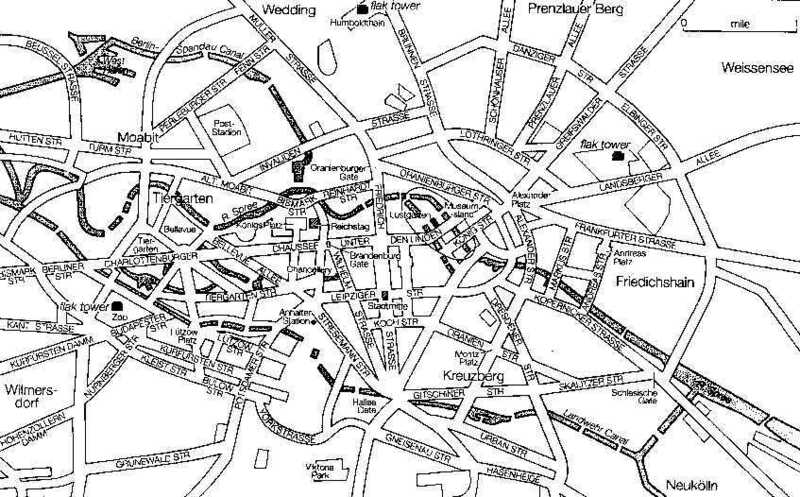 If in fact Adolf Hitler managed to escape from Berlin in 1945 a question apears, HOW? For years i read many different theories most of which do not deserve much credibility but remain a few who actually opens the door to the possibility that this issue is something real. We will start by the theory of the escape tunnel and consequent escape by U Boat to Argentina, Antarctica or theMoon. were part of the project several tunnels coming in and out from Berlin that would integrate massive highways, thesetunnels would reach 8000 km in extent and there are news of that at the date of fall of Berlin had already been builtabout 800 km that would in fact make an excellent escape route, you are going to see in the following documentarythat these tunnels exist and have been hidden from the general public, thanks to some intrepid archaeologiststoday we are raising the tip of the veil on this issue. The 1996 film The Empty Mirror shows Hitler in the underground bunker where he and his clan of loyal backers strive to outlast the destruction of the Third Reich. It is a fictional drama set within the scope of a delusional fantasy; that attempts to explore a psychotic scenario surrounding Adolf Hitler. He interacts with others, among them children, to whom he shows his Welthauptstadt Germania, saying that it was to be made for them. 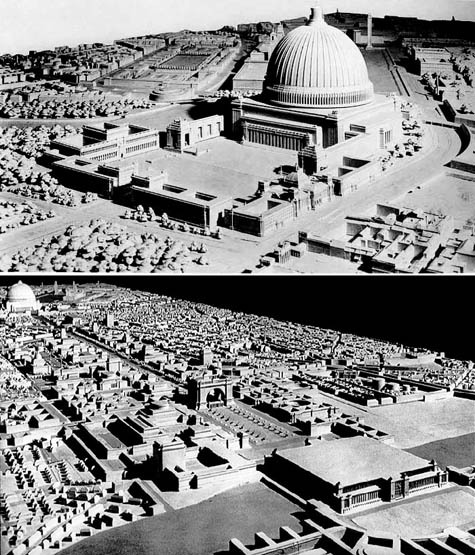 From 1934 on, the city planners and architects of the Third Reich were building large representative structures, wherein the extent of the underground levels surpassed all previous buildings. 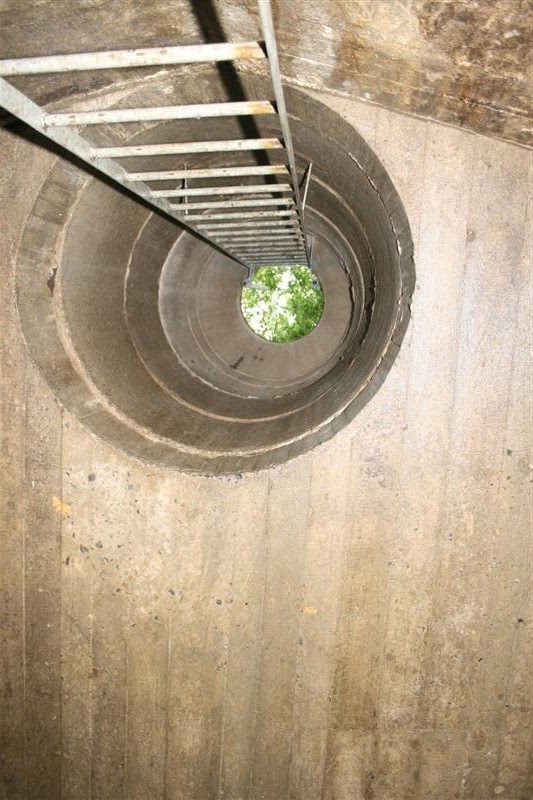 A typical example can be seen in the extension of the Reich bank with its three underground floors and the largest safe in Germany. Also the Tempelhof airport, then the biggest building in the world, has in addition to an underground train connection, over 4.3 kilometres of traversable supply canals wherein the entire infrastructure of the building is housed. In order to prepare Berlin for the 1936 Olympic Games, construction began in 1934 on north-south tunnel of the S-Bahn. 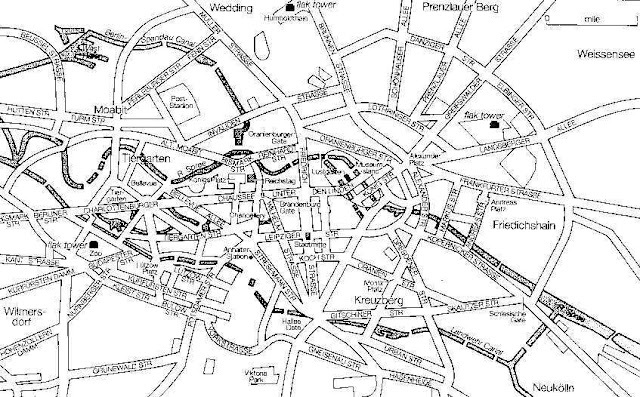 For this large project, the new rulers were able to make use of plans from the 1920s. The project was also used successfully for propaganda purposes, in that with one stroke thousands of workers were able to be employed, who dug the trench more or less by hand. Slogans like: “we thank the Fuehrer that are building here” were hung above the construction site. 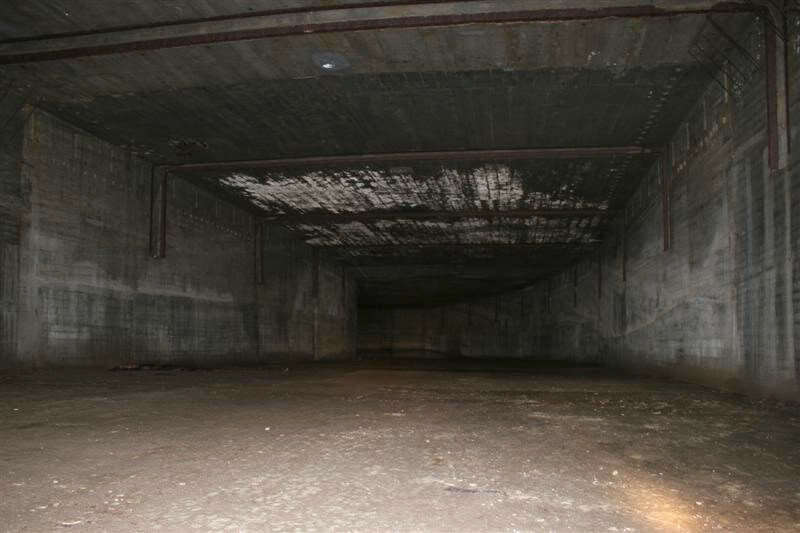 The network of subway and city transit line tunnels could be used for covered movements by both friendly and enemy troops. In case of necessity they could be blocked at various points by setting off explosive charges that had already been planted. 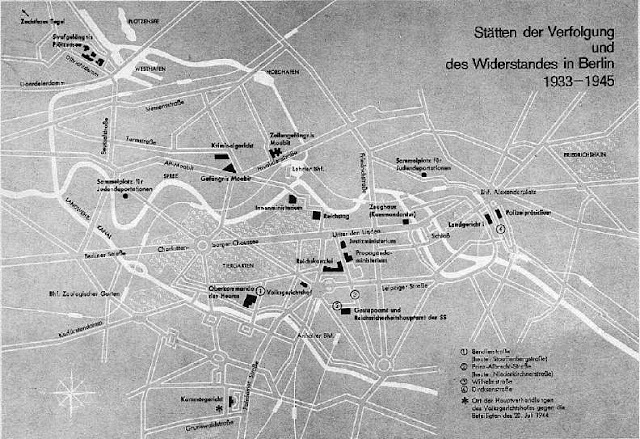 In the course of the battle the city transit line tunnel under the Landwehr Canal was blown up, after which it filled with water. It could not be determined at whose orders this measure was carried out. 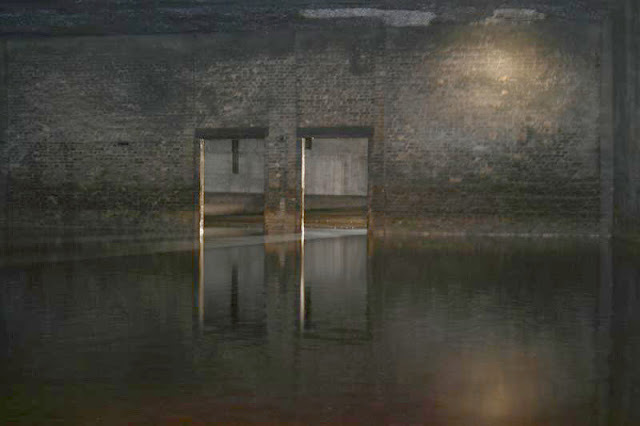 With the blowing up of the Ebert Bridge (east of the Weidendamm Bridge) the city transit line tunnel there was also destroyed, although this was apparently unintentional. Because of these and other explosions, water flowed into large parts of the subway and city transit line tunnels in the heart of the city. 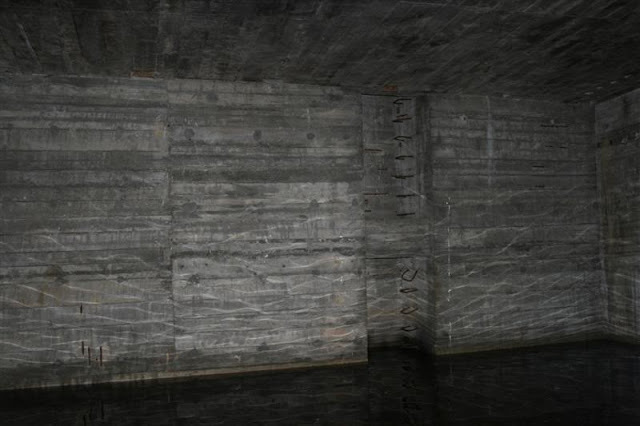 It could not be proven that any appreciable loss of life resulted from the flooding of these tunnels, but it can be seriously doubted that it was justified by military necessity. The tunnel leading from the Zoo railroad station (Bahnhof Zoo) to Ruhleben was heavily used by troops and civilians trying to break out toward the west. It search for means of escape from Berlin at the end of the war comes without doubt the mysterious flight out ofBerlin in a light aircraft of German pilot Hanna Reitsch that flew a small plane in and out of Berlin at least as late as 4/26/45 so even at the end of the Reich it was possible to escape from Berlin. Born in Hirschberg, Silesia, (now Jelenia Góra, Poland) Hanna Reitsch became Germany's leading woman stunt pilot and later chief test pilot for the Luftwaffe. 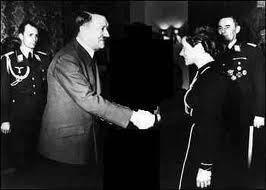 She worshipped Hitler and the Nazi ideology and became the only woman to win the Iron Cross (first and second class). 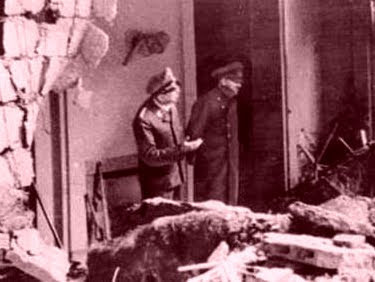 Hanna Reitsch spent three days in the Bunker just before Hitler's suposed suicide on April 28, then flew out with the newly appointed Chief of the Luftwaffe, General Robert Ritter von Greim, who's orders were to mount a bombing attack on the Russian forces who were now approaching the Chancellery and the Führerbunker. 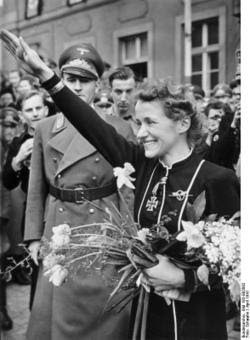 Hanna Reitsch survived the war and died on August 24, 1979 in Frankfurt, from a heart attack. Von Greim was arrested and while awaiting trial committed suicide in a Salzburg hospital on the 24th of May, 1945. Of course, this pilot would undoubtedly someone indicated to remove Hitler out of Berlin, or she or another becausethere were at least four excellent pilots in the bunker on the last days, three of them disappear forever during the fall of Berlin, is here so open the second possibility of escape ... the airway and then Uboat. Others believe she took them to Jugoslavia, then under the military governorship of Sepp Dietrich head of the Waffen SS, who arranged for their secure tenure in that country, whence they left for Argentina in 1947.